Pokémon Go is finally here. After a few delays, the augmented reality-infused Pokémon app launched last week, and spread like wildfire over the weekend, with hordes of eager pokémon trainers taking to the streets to try to catch ‘em all. Confused about how it works? Need a few tips on your way to becoming a pokémon master? Read on. First things first, you’ll need the Pokémon Go app, available for iOS and Android in the United States, Australia, and New Zealand. If you’re not in those areas, hang tight, as Ninantic is rolling out to other regions as time goes on. Once you’ve been logged in, you’ll get a brief introduction by the dreamy Professor Willow, who’ll give you an introduction to the game, and walk you through catching your choice of the three starter pokémon — either a Charmander, Squirtle, or Bulbasaur, which should all be familiar to Pokémon regulars. After that though, the game pretty much leaves you on your own, aside from a small tips section that mostly explains basic map icons. But there three basic parts to Pokémon Go: catching pokémon, visiting pokéstops, and gym battles. Catching pokémon works mostly like you'd expect: you simply walk around with the app open on your phone, which will buzz when pokémon are nearby. Tap on the pokémon on the map, and you’ll switch to the catching interface. The color of the ring surrounding the pokémon helps determine how easy it is to catch — green is easiest, yellow intermediate, and red the most difficult. Pokémon are found at different CP (Combat Power) levels, which more or less determines how powerful the pokémon will be. To raise a pokémon's CP, you'll need two resources: stardust, a generic item you obtain with each pokémon that you catch, and the pokémon's specific candy, which can be obtained by catching duplicates of the pokémon you want to level up. For example, to level up a Zubat’s CP, you’ll need stardust and Zubat candies. Similarly, to evolve your pokémon, you’ll need to use more of that pokémon’s candies, which will also dramatically raise the CP of that pokémon. As your character level increases, you’ll encounter higher level pokémon in the wild and be able to level up the CP level of your pokémon more. 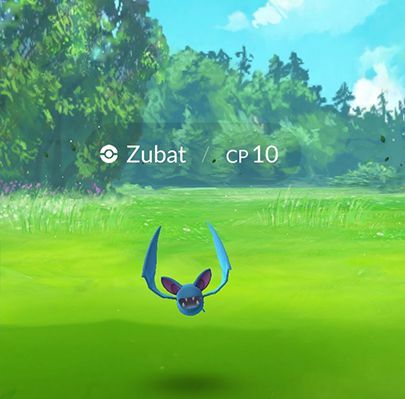 Different pokémon are found in different places — so while The Verge office might be infested with Zubats, going farther afield may result in different or rarer pokémon. Pokéstops are important landmarks, marked on the map at significant (usually) local locations. Visiting pokéstops is the primary way of getting items. When you’re close enough to a pokéstops to activate it, the map icon will expand into a spinning pokéballs icon, allowing you to tap on it to obtain items, such as pokéballs, potions, revives, and eggs (which can be hatched by walking around). 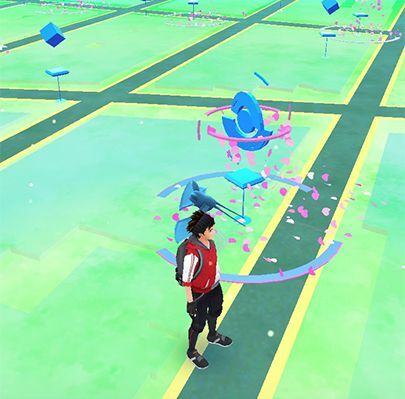 You can also activate lure modules at pokéstops, which are marked by a swarm of hearts on the map, increasing the likelihood of pokémon appearing there. Some items, however, can only be purchased with pokécoins, which can be earned by fighting in gym battles or bought as in-app purchases. How do I level my character up? You can earn experience from nearly every activity in the game — catching pokémon, fighting at a gym, visiting pokéstops — which in turn levels up your character. You’ll also be gifted items when you reach a new level. Additionally, once you reach level five, you’ll be given the chance to choose from one of the three color-coded factions: red Team Valor, yellow Team Instinct, and blue Team Mystic, and have the opportunity to battle other trainers in gyms. Gyms are in-game locations that are typically tied to major real-world areas — such as the Bryant Park Fountain or Times Square — where you can battle other trainers. If a gym is held by your faction, you can select a single pokémon and train against other members of your team, raising the amount of prestige points associated with the gym. The higher the prestige, the more pokémon that can be stationed at the gym, which in turn grants higher daily bonuses of stardust and pokécoins that can be earned. 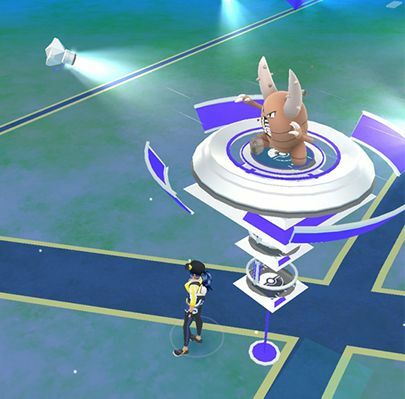 If there’s an open spot at a gym, you can add one of your pokémon to help hold down the fort. Gyms held by one of the two rival factions, however, need to be battled for. If you and your fellow members defeat the pokémon stationed there, you can lower the gym’s prestige and eventually return it to a neutral level. It can then be claimed by your faction and a pokémon can be left there to fight against new challengers. Battling in gyms also gives your pokémon experience and raises their CP and HP. Battling in Pokémon Go is like a simplified version of the classic Game Boy game. Pokémon face off one-on-one, and can use one of two attacks — tapping on the enemy pokémon to do a low-damage light attack, and tap-and-holding to unleash a special attack once your meter has filled. Additionally, you can dodge enemy attacks by swiping left and right. Battles continue until one of the pokémon has fainted. And of course, standard pokémon damage type rules are in effect: water pokémon are effective against fire types, fire against grass, etc. Pokémon can be healed or revived using potions and revives that you can obtain from visiting pokéstops. What are the different items, and how do I get them? Pokéball / Great Ball / Ultra Ball — Pokéballs are your bread and butter tool for catching pokémon. Great balls unlock at level 12 and are better at capturing pokémon, while ultra balls, which unlock at level 20 are even more useful for high-level pokémon. All three can be obtained at pokéstops once you’ve reached the right level, and regular pokéballs can be bought with pokécoins from the Store. Potion / Super Potion / Hyper Potion — Potions allow for pokémon to be healed in between battles. Revives — Allow for revival of pokémon that have fainted in battle. Lucky Egg — An item that doubles the experience you gain in the next half-hour after use. Can be obtained at pokéstops or bought using pokécoins from the store. Razz Berries — A higher-level item obtained starting at level 8, Razz berries can be used on higher level pokémon to help prevent them from running away. More can be found at pokéstops once they've been unlocked. Egg Incubator — Egg incubators are used to hatch eggs, which can contain rare pokémon. You’re given one incubator for free that has unlimited uses, while additional, three-use incubators can be found in pokéstops or bought with pokécoins. Eggs hatch after being incubated for a certain walking distance that depends on the specific egg (usually between two to five kilometers). Lure Module — A temporary use item that can be applied to a pokéstop that increases the chances of encountering wild pokémon at that pokéstop for all nearby users. Can be found at pokéstops or bought using pokécoins form the store. Incense — A temporary use item that increases the likelihood of encoding wild pokémon for the user of the item for the next half-hour after use. Can be found at pokéstops or bought at the store with pokécoins. Buy an external battery! Pokémon Go can be a huge battery drain on your phone, since the app needs to be running constantly. There are no pokémon centers in Pokémon Go, so revives and potions remain the only way to heal injured or fainted pokémon. Wait to evolve pokémon until you're at least level 10 — the boost you receive in CP from evolution is tied to your character level, and the higher your level, the greater the gain. Hopping on a bicycle is a fun, fast way to hatch pokémon eggs quickly. Make sure to stay hydrated when catching pokémon outside. Consider turning off the augmented reality interface — it's fun to see pokémon in the real world, but the camera consumes more battery life and constant movement can make pokémon more difficult to catch. Be smart and make sure to always be aware of your surrounding and people nearby. Pokémon Go relies on Google Maps data — try downloading the maps directly from Google to cut down on battery use and data consumption.